After digging through my collection of masks, I am nearly finished with those from the Moros y Cristianos dance and related dances. 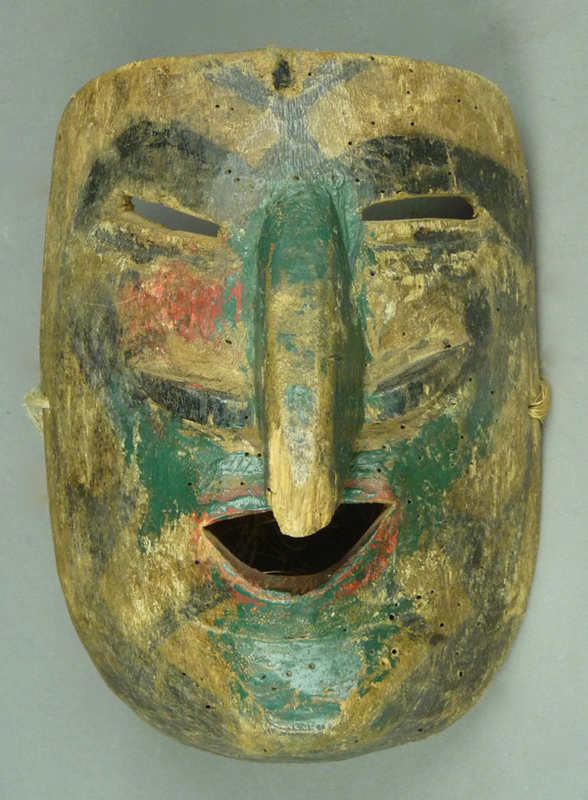 In this post I bring together a variety of unusual but interesting masks from these dances, which did not fit so neatly with others from their respective states. Almost all of them are special gems in terms of artistry and rarity, but no two are alike. The first, a gift from Robin and Barbara Cleaver in 1988, was reportedly a Moro mask from the Mexican State of Puebla. Moors with green faces are uncommon in Mexico. In my view, as you may recall from my posts about Xantolo masks from Hidalgo and Veracruz, masks with unrealistic colors such as yellow, blue and green, are frequently worn by dancers who depict the bodies or souls of the dead. 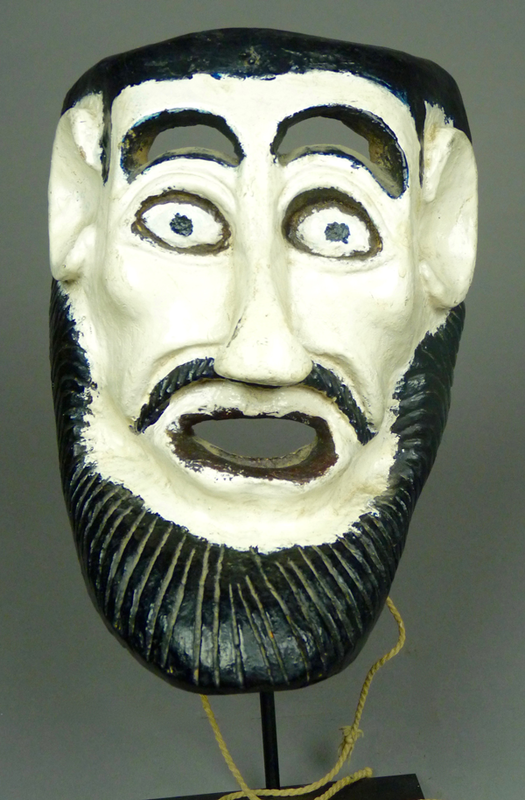 One could suppose that this mask might represent a Moor or Santiaguero that has been recycled for some other dance such as Xantolos or Carnaval (Mardi Gras). I have long admired the jolly mouth on this mask. Today we will look at three white faced masks from the Moros y Cristianos and related Santiagueros performances in Puebla. Evidently these represented Christians or Spaniards (Pilatos). I purchased the first of these from Spencer Throckmorton, in Manhatten, in 1996. 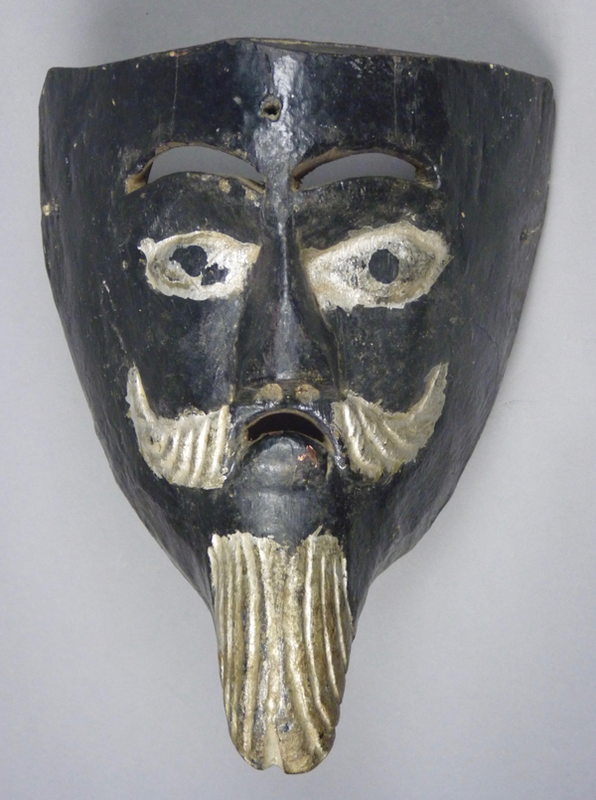 This dramatic mask had previously been in the collection of Raoul Kampfer, a well known Mexican mid-20th century antiquarian and collector. It was said to be a Moro, but I suppose that it was a Pilato (Spaniard) from the Santiagueros dance, and it could easily have been one of the leaders, such as Pilate himself or the Emperor Tiberius. This mask seems more like a caricature than a portrait. Spencer had commissioned a metal stand, which remains. 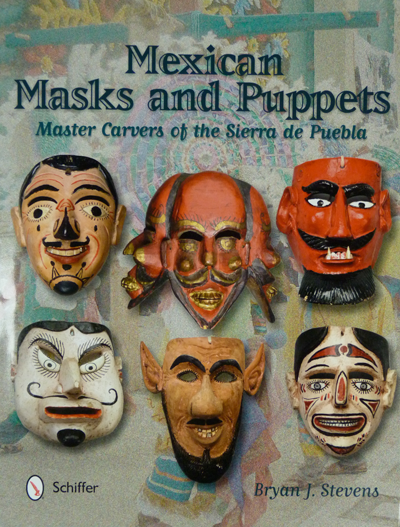 Last week I began with a Moro mask from the Mexican State of Puebla that had a black face, followed by other Moros y Cristianos masks that were not black, and apparently depicted Christian figures. All four had similar features. One of those was apparently worn by a Christian figure in a variant of the Danza de Moros y Cristianos, called “El Misterio de los Negros.” The black-faced mask was not explicitly identified with that dance, although it could easily have been used with the other one. 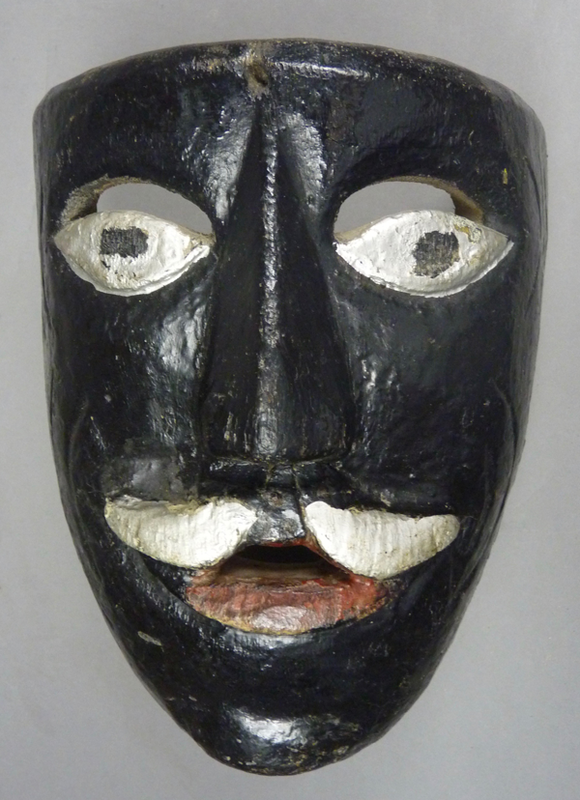 In the course of my writing about these masks, I realized that I owned a group of three Black Moor masks from neighboring states that also appeared to have been used in El Misterio de los Negros. None of these are from Puebla, but from Veracruz, Guerrero, and the State of Mexico. I must confess that my information about the existence of this dance drama is limited. The first of today’s masks is specifically labeled on the back as being from this dance, and Jaled Muyaes told me of others, although he said nothing about this dance in his published writings about masks. I bought this one in 2008 from the estate of my friend, Gary Collison. Although the tag said it was from Guerrero, this is the mask with writing on the back that identifies it as a mask from El Mysterio de los Negros, Veracruz. It is a handsome elegant mask. The face has a very simple design. Today I will present four Moro masks from the State of Puebla that share similar features, as if all were by the same hand or from the same local tradition. I don’t believe that I have ever shown you the first of these. I did show you the second in my post of September 15, 2014, along with the third mask, and I featured the fourth in my post of May 18, 2015. The point of today’s post is to put the four side by side. Unfortunately I still do not know the name of the carver(s). I purchased the first from John Kania and Joe Ferrin of Santa Fe, in 1996. It was said to be from Chichiquila, Puebla. A nearly identical mask in the Museo National de la Máscara:Catálogo (p. 80) is said to be from San Pablito, Municipio Pahuatlán, Puebla. As we have already seen in earlier posts, sometimes Moors are depicted with black faces—”Blackamoors.” The literal meaning of Blackamoor is “Black African,” but this word would appear to reflect the confusion experienced by Europeans from their early contacts with Africa and its peoples. In contrast, two weeks ago I showed characters from the “Negritos” dance who all had Caucasian faces. As I have repeatedly noted, a common reason for such confusing labels in Mexican dance dramas is that Mexican Indian dancers seldom portray themselves, instead they generally disguise themselves as others; from this place of anonymity and obfuscation the dancers feel free to address otherwise dangerous or forbidden social commentary.